When precious metals or other valuables are excavated from shipwrecks, how do companies go about getting them to look like they did before they spent a century or two underwater? Ferrous metals such as iron and steel undergo a separate process than many other types of metals. This can be a very time-consuming procedure. Ferrous metals are porous, and so spending any great amount of time underwater will cause sea water to seep into the metal. This can cause the metal to have a black tint and a corroded outer layer. Many people think that just knocking the corroded layer off is enough, but this is not the case. The corroded outer layer is the only thing keeping the porous metal from dissolving completely. If one was to knock the corrosion off, the metal would likely deteriorate into an orange dusty substance. In order to prevent this from happening, companies will keep the ferrous metal soaking after the corrosion has been removed. They will then bathe the metal in a fresh water and nitric acid bath. After this process is complete, the metal will then be washed a few more times in baths of fresh water. Silver is a delicate metal and will require its own particular process for cleaning. The shipwreck company may choose to use an electrolytic reduction process, which involves hooking the metal up to a 6 or 12 volt battery between two sheets of iron. The silver will sit in a bath of caustic soda during the operation. This will allow the hydrogen to evolve and corrosion will be removed. Another option for cleaning silver is to let it soak in a hydroxide and fresh water bath. It will likely have to soak for a month or two in this mixture. After that time has elapsed, zinc will be added to the bath, causing the substance to bubble. After another month or so, the silver will have a white coating on it. It will be transferred to a bath of sulfuric acid and fresh water. It will then need to be bathed in fresh water for at least a week and brushed several times a day. It will then be transferred to distilled water for another week. Next the silver will need to be heated in an oven at around 212 degrees Fahrenheit for a day or two, depending on size. The object will then need to be sealed with lacquer or plastic spray. Obviously this is a very complicated, time consuming process. Silver is one of the most difficult metals to preserve for this reason. 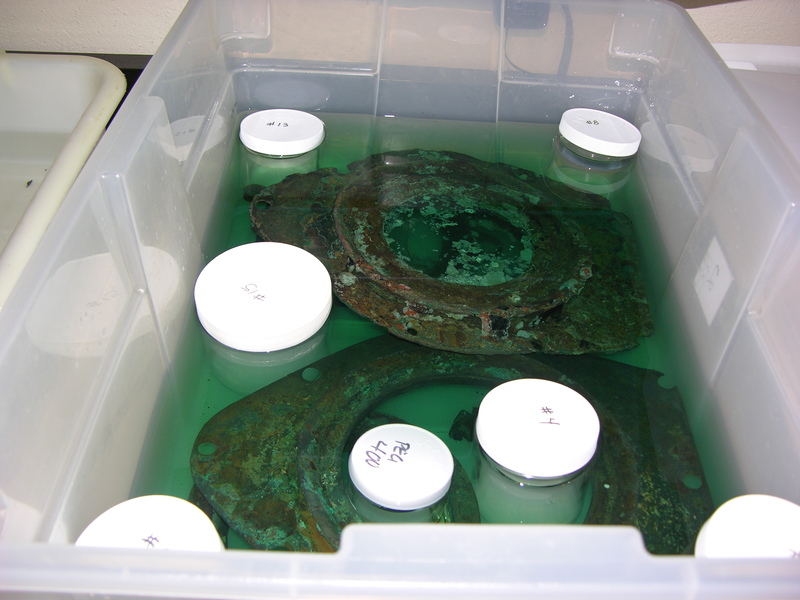 Nonferrous metals, such as copper, brass and bronze are generally not as affected by their time underwater and do not take nearly as long to clean. They are generally soaked in nitric acid and fresh water and then left in a fresh water bath and scrubbed periodically. Steel wool is all that is needed at this point to return the objects to their previous luster. Wooden objects are usually quite affected by underwater fungi and bacteria. These will need to be soaked in fresh water immediately, and then after a month or so, the object can either be dehydrated or can undergo an aluminum, glycerin and water bath, and then coated with turpentine and linseed oil. The conversation efforts for underwater cargo often take months to complete. Waiting too long to begin the process or messing up a step could mean destroying a valuable artifact or piece of metal. Great article on handling of submerged artifacts. Question: How would GOLD & PLATINUM be handled under the same circumstrances you mentioned.